Obsessed! 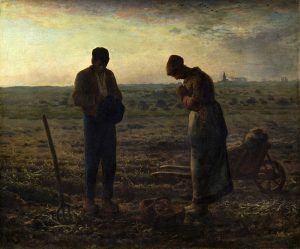 There’s probably no better way to put it when it came to Salvador Dali’s relentless focus on The Angelus – a painting by Jean-Francois Millet. Dali saw the widely known, iconic painting of a peasant couple in prayer as an image of repressed sexual desire. And he also saw it as a funeral scene, since he’d long contended that the 19th century French painter had originally depicted a child’s coffin where the basket is. The Louvre eventually proceeded with an X-ray examination of the Millet canvas, discovering quite astonishingly the outline of a small casket underneath the basket of potatoes! The two bowed figures appeared in countless Dali paintings, drawings, prints, watercolors, sculpture and objects he designed or inspired. One painting of 1932, titled simply Angelus, is one this historian was not aware of until only a few years ago. It showed up in a catalog or book somewhere, and, though around for some 80-plus years, was “new” to me. 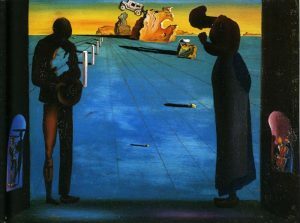 As a Dali historian, am I to love every Salvador Dali painting or print or whatever creation this genius and master of Surrealism produced? No. Do I love – or at least really like – most of what Dali did? Sure I do. But not all of it. Angelus is one Dali picture I’m not enamored of, but it does perpetuate Dali’s Angelus of Millet obsession. And it does invite a look at a few features here. The black left and right borders, together with the large open space that recedes to the vanishing point, give the painting the look of a stage design or theatre backdrop. I remember, upon first seeing a reproduction of this painting, being drawn to the two recessed spaces in which, at left, we see two figures with long objects (bread?) on their heads, and at right a formally dressed man playing a cello. These details seem to suggest the balconies of a grand music hall, adding to the theater backdrop feel of this work. I like the way these two spaces are “cut” into the otherwise flat and frankly rather drab look of this composition. 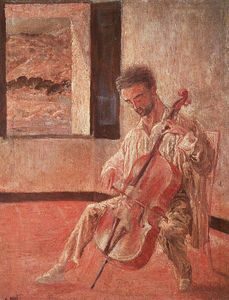 What’s more, the cello-playing figure recalls the 1920 work, Portrait of the Cellist Ricardo Pichot. Dali saw the woman’s posture in Millet’s Angelus as suggestive of a female praying mantis, which devours its mate after copulation. Could that account for the gaping hole in the man’s chest? And the fact that he’s partially naked? I’ve written quite a lot about the concept of Dalinian Continuity – the linking of one Dali work to another by the intentional repetition of certain images. We see it here, in Angelus, not only in the obvious Angelus of Millet figures, but also in the car growing out of the rocky cliff formation in the middle distance. The same car “growing” out of rock was to appear the following year (1933-1934) in an untitled Dali painting, which recently came to auction and brought a very large million dollar-plus sum for a very small painting. Untitled, this small Dali recently brought a big chunk of change at auction. Angelus seems to lack the fluid magic of most Dali works from this fertile 1930s period of his best surrealism. That’s how I see it, anyway. Hey, they can’t all be home runs.